You too, can make fancy salads at home. Specially marinaded chicken, then grilled and serviced with a crisp salad is a fantastic light meal. Make a great chicken salad just like the Mason Jar does. Prepare marinade and marinate chicken, skin side up, at least 3 hours. Grill chicken and remove skin. Place lettuce on a large plate. 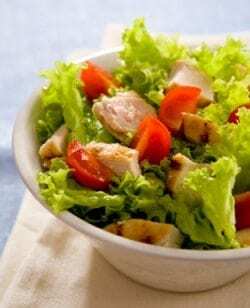 Slice chicken and place on top of lettuce. Garnish with egg, bacon, croutons and tomato wedges. Add Lie Vinaigrette Dressing or serve on the side. Makes 1 serving. Marinade In a large bowl, combine brown sugar, soy sauce, sherry, pineapple juice, vinegar, garlic, and ginger. Mix well. Makes enough marinade for 6 chicken breasts. Vinaigrette Combine oil, vinegar, garlic, salt, pepper, oregano, sugar and mustard in a blender; whirl until fully blended. Makes about 2 cups. I loved this one I will totally make it again my family loved it. It tasted so good I made it 5 times in one week that’s how much my family loved it . Mason Jar is so good! I love this salad, I’m so glad to have the marinade This will be great for a light lunch!